Massive Acclaim For DARK MATTER! Michelle’s hotly-anticipated ghost story, DARK MATTER, has been published in the UK to massive critical acclaim. DARK MATTER deals with an expedition to the Arctic that goes badly wrong. By a strange quirk of fate, the publisher’s promotional video for the book is eerily similar to film of another (real life) polar expedition that is premiered on the day of DARK MATTER’s launch. The two videos are shown below. 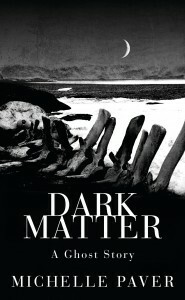 Read about the writing of DARK MATTER here. There are lots of ways to contact Michelle. The most exciting is Michelle LIVE! – her monthly show on Facebook and YouTube. You can send her a question in advance, or send her a comment on Twitter, Facebook, YouTube or Instgram live during the show itself! Full details here. Subscribe to Michelle’s occasional newsletter below – your email address will not be shared with third parties, and you can unsubscribe at any time.